Paul Haines, principal of Lakewoods Public School, is being awarded for his efforts to provide students with a school they can call their own. 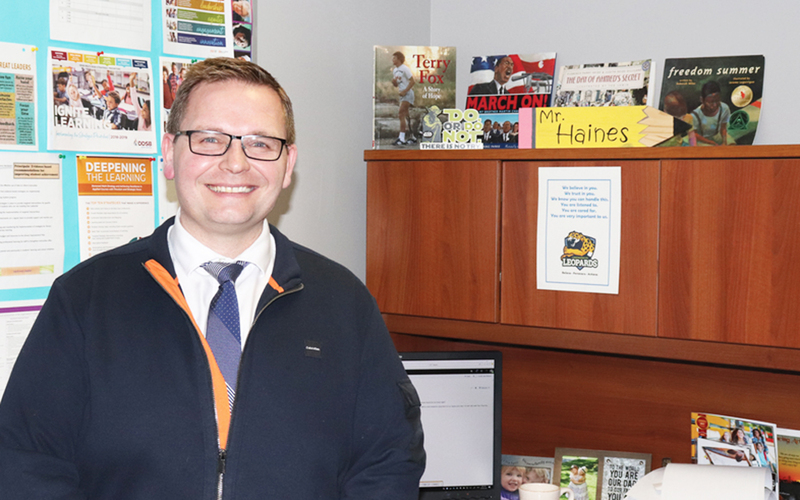 He is one of 30 recipients of the Learning Partnership’s Canada’s Outstanding Principals for 2019. Haines has been a principal at Lakewoods for the last two-and-a-half years. Prior to that, he served as vice principal for four-and-a-half years. He began his teaching career in 2002, with stints as a classroom teacher, a special education resource teacher, and administrator before taking on the vice-principal position. Haines says he is incredibly proud to be the principal at Lakewoods, and he loves working with the parents and the community to make sure the students are successful. “We have a really strong relationship between our school and the Durham District School Board, which supports us with things like literacy and numeracy coaches, facilitators, and we’ve been fortunate enough to get some IGNITE innovation grants and things like that to help to make our school a great place,” says Haines. When students found out he’d won the award, Haines says he received a lot of congratulations from them and staff as well. He says some students expressed regret at not knowing they could have voted for him. Haines also notes some of the letters were about how he reads to the students everyday. “[The letters] talked about how they thought that was a pretty neat thing to see a principal doing,” he says. Haines says he believes he stood out by creating an environment where everyone is trying to learn and grow, and the way the school collaborates with students, parents and the community. “I guess I would say that my ability to be the lead learner in the school, to take advantage of the opportunities that the DDSB provides in terms of getting professional development for staff, I’m there learning alongside staff and constantly trying to grow myself as an educator, to try and meet the needs of our students,” says Haines. Haines says he strongly believes in having high expectations for students, but also thinks students are more likely to be successful if the necessary conditions are in place. Charles Senior, communications officer for DDSB, says the board feels very proud that a principal in their district is being given this honour. “I’ve only met Paul as of this year, but the feedback that I’ve gotten from hearing from staff at the board who know Paul is that it couldn’t have gone to a better person,” says Senior. He says speaking with people who know Haines, he’s seen tears shed when they talk about his role in the school, and how he has had an impact on people’s lives. Haines will be accepting the honour at the annual Canada’s Outstanding Principals awards celebration on Feb. 26.